Our Christmas vacation this year was a trip to The Kiawah Island Golf Resort in the Low Country of South Carolina, not far from the historic city of. Charleston. We took a day to drive into the city, which was bustling with tourists like us and holiday crowds. South Carolina low country has a profusion of churches and Charleston is the same. What is interesting about the churches in the city is the age, history and variety of christian denominations represented. We first visited St Michael’s Church on the site of the first Anglican Church built south of Virginia. Erected in 1680 as St Phillips Church and subsequently rebuilt several time to replace buildings destroyed by fire or grown too small for the congregation, the current building was opened for services in 1761. The church exterior is dominated by a near 200 ft steeple and weathervane. The interior is very intimate with the native cedar pews almost on top of the altar and galleries hanging over on three sides. The pews have doors at each end, perhaps to ensure the the right people sit there. To the left of the very high pulpit is a small platform where the very small Nativity Set was placed. We thought this an insufficient display for such an historic and inspiring church. We had been advised to visit the French Huguenot Church, built in the ” French Quarter” of Charleston in 1844. The Huguenots were French Calvinists who faced suppression in France and were very nearly wiped by successive Louis Kings. Growing up English Protestant in Montreal. I can remember being surprised to hear of a French Protestant school surviving in a sea of French Catholics. The present Huguenot church in Charleston, like St Michaels, was rebuilt after a fire and survived damage from the Civil War and the Charleston Earthquake. When we visited, the church was closed for major exterior renovation. Not surprisingly services are conducted in English, except for an annual service in French to celebrate spring. We then visited the main Roman Catholic Cathedral of St John the Baptist, which is a newly constructed but large and inspiring version of classic church design.As is usual in Catholic churches, there were about five different things going on at the same time. I have always been impressed with their level of activity and utilization of their facilities on days other than Sunday. A very good business model. We had lunch at S N O B, which is not elitist but stands for Slightly North Of Broad (street). Reservations were required and the food was a wonderful blend of southern and foreign influences. After lunch we went looking for a Nativity customer who had purchased our Christmas Nativity 40″ and had asked us to drop by when we were in Charleston. The city is a small area and much easier to walk around than drive. Our customer was in a classic Charleston house on a corner of the Historic Area south of Broad Street and sheltered from the street by a wall and wrought iron fence. With luck, we found the creche and had a nice chat with the family. 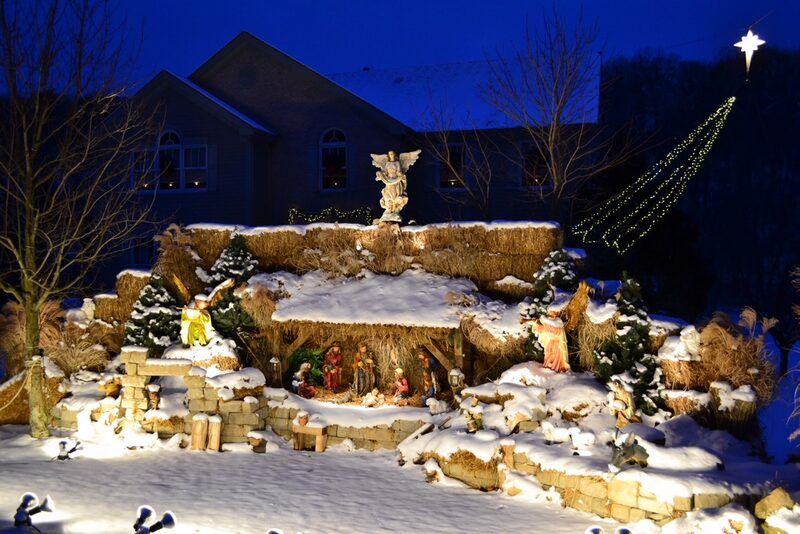 They plan to buy a a larger stable and add new pieces to the Nativity, including the camel.